Well, we all have heard stories about these special occasions where our beloved red icons became personalised by wearing completely unfamiliar colours. Apart from the French blue 500 driven by Rosier and the American white and dark blue Dino 246 in Phil Hill's hands at Sebring in 1959, there seem to have been quite a couple of occasions where the colour scheme has been altered (see the story of the NART entries). Not all of them are beyond doubt, as we still maintain a certain degree of scepticism over Mike Hawthorn's alleged green 500 in the 1953 Argentine GP. 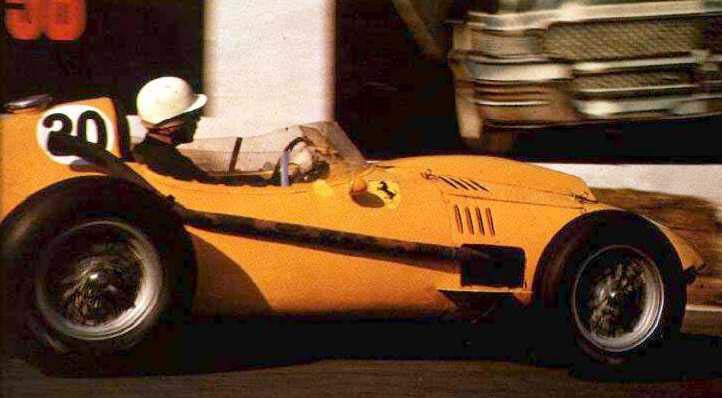 Whatever the technicalities, it is certain one colour appeared several times on a works Ferrari during Grand Prix meetings in the fifties: Belgian yellow. The most prominent example is that of Belgian sportscar ace Olivier Gendebien, who raced a yellow Ferrari at his 1958 home Grand Prix. Born from a wealthy Belgian family (some sources actually convert his wealth into aristocracy) in Brussels on 12 January 1924, Gendebien was a paratrooper in World War II before spending some four years in forestry in the Congo, where he met a rally driver named Charles Fraikin. Legend goes that Fraikin was lamenting the lack of a co-driver with whom to compete when he would return to Europe. So, after their journey back to Belgium and racing a Veritas in the GP des Frontières at Chimay, finishing sixth, Gendebien joined Fraikin, initially to drive a Jaguar in rally events. They stayed together until 1955, but by then Gendebien had full well proven himself as a driver in his own right. By the time they split up they had become known as 'the eternal bridesmaids' due to the number of times they had to be content with second place. Twice they just missed winning the Liège-Rome-Liège Rally but in 1955 it was third time lucky with a Mercedes 300SL. Without his partner, Olivier had great success, winning his class with a Plymouth in the Round Italy Rally, the Tulip Rally and the Northern Roads Rally in a Porsche, all in 1954. His career then gathered pace. Such was the impression made that he was offered a contract to drive a works Ferrari in sportscar events and selected Grands Prix. His first race for the team nearly ended in disaster, when in late 1955 he crashed heavily in practice for the Tourist Trophy at Dundrod, suffering concussion. He was fit for the start of 1956 and, with virtually no single-seater experience behind him, finished fifth on his Grand Prix debut at the Argentine GP, followed by sixth in the Mendoza GP. The season also saw a splendid run of finishes in sportscar races, including second places at Buenos Aires, in the Supercortemaggiore at Monza and in the Nürburgring 1000kms (with Alfonso de Portago), third at Le Mans (with Trintignant) and the Targa Florio. Having found his way into Jacques Swaters' Ecurie Francorchamps (by then renamed Equipe Nationale Belge), Gendebien managed to cause a stir by the end of 1956 finishing third with a 250GT in both the Liège-Rome-Liège Rally and the Tour de France. It had been a great season, and six more in Ferrari's great sportscar team were to follow. In April 1957, with his cousin Jacques Washer as a passenger in the ENB 250 GT, Olivier scored a brilliant victory in the Tour of Sicily and then was a stunning third overall in the last Mille Miglia. He subsequently won, with the same car, the Reims 12 Hours (with Paul Frère) and then wrapped up the season with a win in the Tour de France (with Lucien Bianchi). Belgium had a new star, and Olivier was starting to get on a roll. He won again at the Reims 12 Hours in 1958 before starting off on a string of victories at the Targa Florio (with Musso), to be followed by the 1961 edition (with Von Trips) and finally the 1962 one (with Mairesse and Ricardo Rodriguez). Other famous wins included the Sebring 12 Hours editions of 1959 (with Phil Hill, Dan Gurney and Chuck Daigh), 1960 (this time in a Porsche, with Hans Herrmann) and 1961 (again with Phil Hill) and the Nürburgring 1000kms in 1962. His most remarkable achievement was his unbeaten run of four wins at the Le Mans 24 Hours in 1958, 1960, 1961 and 1962, after the last of which he retired. Three times he shared the glory with Phil Hill, whilst 1960 was the year that Paul Frère co-drove. Gendebien's sportscar success overshadowed an impressive Grand Prix record. Although he managed just 14 starts between 1956 and 1961, he scored points in half of them. For most of that time he was Ferrari's spare driver, filling in in odd races (here trailing Trintignant's Cooper at Monza in 1959), but he scored his best results with BRP's Yeoman Credit Cooper T51 in 1960, finishing third at Spa - where team mate Chris Bristow was killed - and then a fine second to Jack Brabham at Reims. Despite missing four of the season's nine GPs, he earned a creditable sixth place in the World Championship. In 1961 Gendebien was back with Ferrari for what was his last GP drive at Spa, when he was the fourth man on the team for the Belgian Grand Prix. He was given a 156 "shark-nose" but unlike his team mates, who had the latest 120-degree V6 engines at their disposal, he had to contend with the less powerful 65-deg unit (see the Baghetti story). Again, his car was painted yellow for the race and entered by Ecurie Francorchamps (ENB having recovered its original name by then). He gloriously led in the opening laps, but was overwhelmed by his team mates and finished fourth. As said, Gendebien retired in 1962, at 38 years of age, after his fourth Le Mans success. A look at a list of former co-drivers (Peter Collins, Alfonso de Portago, Luigi Musso and Wolfgang von Trips) perhaps helps to explain his decision to get out at the top, with his head, body and limbs all intact. Aged 74, he died on 2 October 1998. In My Terrible Joys Enzo Ferrari memorably described Gendebien as: "A gentleman who never forgets that noblesse oblige and, when he is at the wheel, he translates this code of behaviour into an elegant and discerning forcefulness. He drives without hurting the car, taking care of it and one can always count on him to drive with the precision of clock machinery. One has to let him talk, however, when he wins, and that happens quite frequently." This was the third Championship event for the Belgian driver, who made his single-seater (and racing) debut driving a Veritas in the race won by Frere at Chimay in 1952, with Gendebien finishing sixth. In the WDC, Gendebien drove eight races for Scuderia Ferrari, five for the Yeoman Credit Racing Team, and one each for Equipe Nationale Belge and the United Dominion Trust Laystall Racing team between Buenos Aires in 1956 and Watkins Glen in 1961. He managed to score 18 points in his 14 appearances, so not a bad record at all. During the Second World War, Gendebien served in the paratroopers and ended up after the War, like so many, in other places, in his case the Congo. In 1952, he returned to Belgium and teamed up with Charles Fraikin to compete in national and later international rallies. In 1955 they won the Liège-Rome-Liège Rally - one of the most difficult on the calendar. On his own, Gendebien was very successful in the rally world and in 1955 was asked to join the Ferrari sports car team. In his first event, the Tourist Trophy in Northern Ireland, he crashed during practice and missed the event. In sports car he was simply superb, only Phil Hill being his true equal at Ferrari during his tenure there. Together they won Le Mans in 1958, 1961, and 1962 with Gendebien sharing the honors with Frère in 1960. Gendebien also had victories in the Reims 12 Hour race in 1957 and 1958; Sebring for three years in succession - 1959, 1960, and 1961; the Nürburgring 1000km in 1962; the Targa Florio in 1958, 1961, and 1962. A fantastic record in sports car racing. He even drove in the 1962 Daytona races and generally impressed the NASCAR drivers with his ability, several offering the opinion that he would excel at the sport should he attempt to run the championship circuit. The 1958 Belgian race is usually remembered for the fiasco at the start when the starter held the cars on the grid - which is on a slope - for what seemed an eternity. Both cars and drivers were boiling by the time the flag was waved to get the race under way. Moss blasted off into the lead, but somehow managed to miss a shift and that was that for him. Masten Gregory pitted his Maserati as a result of the engine overheating from the wait on the grid. Collins took the lead, but as his engine had also reached some very high temperatures on the grid, he was also forced to retire. Jean Behra retired his BRM at about the same time when the oil pressure dropped, which was in some part also due to the long wait on the grid. Brooks led to the checker, but only barely managed to take the flag since the gearbox in the Vanwall was in the Serious Failure Very Soon mode. When the gearbox finally died, it was just prior to the final turn, La Source, and he rolled across the line. The Dino of Hawthorn literally blew up as he crossed the line, Lewis-Evans was fortunate that when his suspension failed he was able to limp to the finish, and the Lotus of Cliff Allison blasted by with the exhaust pipe barely hanging on the car. Had the race been over the 508km of the 1956 event - 36 laps - rather than the 24 laps and 338km of that year's event, one is left to wonder just exactly who would have been left to win the event. Indeed, should the race just been one or two laps longer it could have been Allison giving Lotus its first victory or Harry Schell BRM its first. Of even one of the others still circulating. Gendebien had a frustrating race. After being in third on the first lap, he was fourth on lap three went forced to pit. He was dead last when he rejoined the race and came back through the pack, finally ending up in sixth place. Had he not been forced to pit, his pace was such that he would have easily been on the same pace as Hawthorn or Brooks and probably earned a place on the podium. The Dino that Gendebien raced was the original F2 car converted from its 156 form to accept a 2.4-litre version of the V-6. Although legend has it that Ferrari's son, Alfredo - 'Alfredino' or 'Dino' - was the designer or engineer for the new V-6 design that introduced in 1957 as a means to wage war in the new F2 class, it was Vittorio Jano who actually did the pencil work. The role of Dino was to play was to assist in the development of engine was in the investigation of what layout would be best suited for the purpose at hand. When Dino died on 30 June 1956, Ferrari was devastated. The design that Jano produced was dubbed 'Dino' in honor of Ferrari's deceased son. The engine was a 65o V-6, 70mm x 64.5mm for a capacity of 1,489.35cc. It turned out to be a very sound design and was built with other uses in mind. This was a good thing since the Lancia D.50 was pretty much at the end of its tether as an F1 contender at the end of the 1957 season. The Dino 156 was pretty much on target out of the box. In April, at Posillipo for the GP di Napoli, Luigi Musso brought the new car home in third place. At Reims in July for the Coupe de Vitesse, Maurice Trintignant romped home first and made the Cooper and Porsche crowds groan. Incidentally, the chassis number sequence began with '0011' since that is where that of the D.50 left off. The 801 of 1957 was merely the D.50 redesignated and modified for the season. It wasn't a new car, contrary to what many think - and thought at the time.